The Palestinian Campaign for the Academic and Cultural Boycott of Israel (PACBI) is pleased to host a conversation with Roger Waters on his involvement in the cultural boycott of Israel and support for Palestinians’ rights. Roger Waters is an English rock musician, singer-songwriter, and composer. He is best known as the bass player, co-lead vocalist, lyricist and the principal songwriter in the rock band Pink Floyd.The conversation will be led by Noura Erakat, a Palestinian human rights attorney and activist. The Palestinian Campaign for the Academic and Cultural Boycott of Israel (PACBI) invites Facebook users to join the movement for a live, hour-long conversation on the cultural boycott of Israel with one of today’s leading musicians. 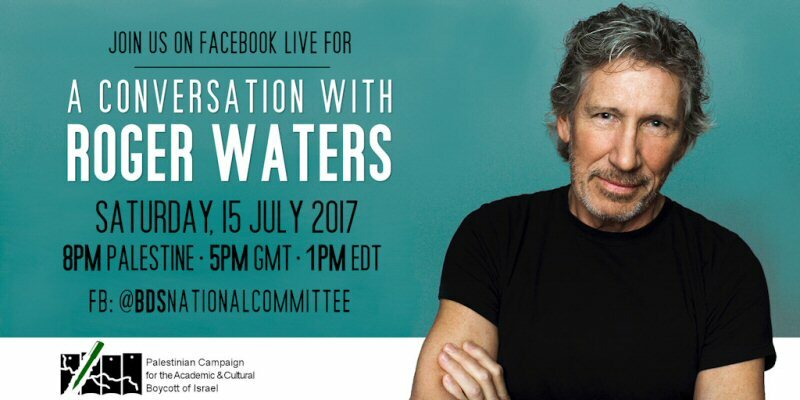 The Palestinian Campaign for the Academic and Cultural Boycott of Israel (PACBI) is excited to host a conversation with Roger Waters on his support for the cultural boycott of Israel and Palestinians’ rights. The conversation will be led by Noura Erakat, a Palestinian human rights attorney and activist. The broadcast will occur live, from the Palestinian BDS National Committee’s Facebook page. Tune in on Saturday, July 15 at 5pm GMT for an hour-long conversation with one of today’s leading musicians. Via the BDS National Commitee.